2017 New York-Penn League All-Star Game! 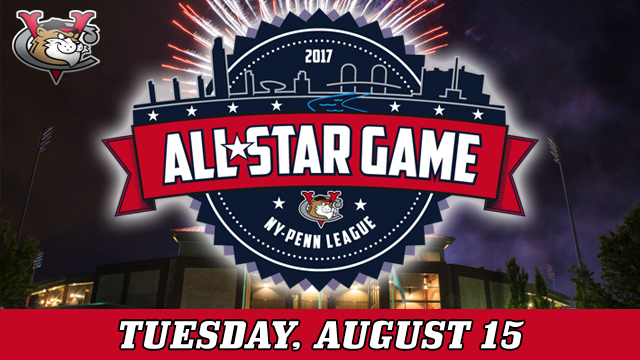 The best and brightest stars of the New York-Penn League will gather at Joseph L. Bruno Stadium in Troy on Tuesday, August 15 for the 2017 New York-Penn League All-Star Game!! All-Star Game festivities will be a two-day event that will feature a Fan Fest the night before the game, a pregame autograph session with the players, and many more fan-interactive activities. Stay tuned for a full list of events surrounding the All-Star Game! How can I obtain tickets to the All-Star Game? Group Outing. Contact a ValleyCats representative at 518-629-CATS for more information on group outings or how your company can become an All-Star sponsor. For more information, contact the ValleyCats administrative offices at 518-629-2287. Joseph L. Bruno Stadium last played host to the New York-Penn League All-Star Game in 2008, drew over 6,000 fans, and was televised on Time Warner Cable Sports. ValleyCats own David Flores took home MVP honors and gave the NL the victory in the bottom of the ninth with a walk-off double! Future Major Leaguers J.B. Shuck, David Phelps, Pat Venditte, and Chase d'Arnaud, all played in the game that year! Check out the photo slideshow below. Founded in 1939, the New York-Penn League is the premier Short-Season league of Minor League Baseball, and the oldest continually operated Class A league. Their 14 clubs are spread across eight states, including New York, Pennsylvania, Massachusetts, Connecticut, Vermont, Maryland, Ohio, and West Virginia. Major League affiliations include the Orioles, Nationals, Marlins, Mets, Tigers, Rays, Red Sox, Indians, Cardinals, Yankees, Astros, Athletics, Pirates, and Phillies. Many of the stars you see each year in the NYPL All-Star Game have reached the Major League level, including Bobby Parnell, Gaby Sanchez, Wade Davis, Scott Sizemore, Brennan Boesch, Jeremy Hellickson, Casper Wells, Guillermo Moscoso, Pat Venditte, J.B. Shuck, David Phelps, Chris d'Arnaud, Jimmy Paredes, Zoilo Almonte, Brock Holt, J.D. Martinez, Adam Warren, Darrell Cecilliani, Chase Whitley, Mason Williams, Matt Duffy, Branden Pinder, James Pazos, Trey Mancini, Michael Feliz, and more!